US authorities have charged three former bosses at voicemail software firm Comverse with fraud over the alleged manipulation of stock options. The Securities and Exchange Commission and Justice Department issued civil and criminal charges against the trio. More than 80 companies including Apple Computer have said they are either investigating their own option schemes or are being probed by the government. The inquiries relate to the backdating of stock options to boost their value. Stock options are part of many senior executive salary packages, and were a popular way of attracting and retaining employees at technology firms during the dot.com boom period of the late 1990s and early 2000s. They give a person the right to buy a certain amount of shares in their company, within a certain period at a particular price - which is usually set at whatever the company's share price is on the day the option is granted. Backdating involves increasing the value of stock options by pinning their "exercise price" - the price at which they can be bought - to a low point in the company's share price history. Although it is not illegal to backdate options, federal prosecutors have said they will prosecute if the backdated options were not properly accounted for. Failure to account for backdated options can result in a company's profits being overstated and taxes underpaid - both of which are damaging for investors. 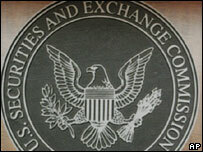 In its complaint issued on Wednesday, the Securities and Exchange Commission (SEC) accused former Comverse chief executive Jacob "Kobi" Alexander and finance chief David Kreinberg of using fictitious names to create stock options that were kept in a slush fund so that they could be used later to recruit or retain workers. It said Mr Alexander wired $60m (£31m) to Israel from the proceeds of fraudulent stock options. Together with former Comverse general counsel William Sorin, the two were charged with conspiracy to commit securities fraud, mail fraud and wire fraud. None of the accused or their legal representatives have so far been available to comment. 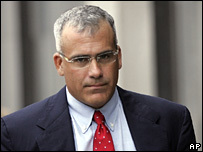 Gregory Reyes, the former head of computer firm Brocade Communications, was the first executive charged as part of the options investigation back in July.